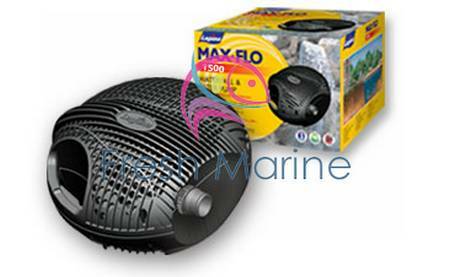 FreshMarine.com - Laguna Ponds Max Flow 1500 - Waterfall Pump Pond - Buy Laguna Ponds Max Flow 1500 Now and Save! Laguna Ponds Max Flow 1500 Pump, Waterfall Pump Pond, 1500 GPH from Laguna: High performance pond pumps ideal for filtration systems, waterfalls, and watercourses. Durable "pre-filter" pump cage minimizes pump damage and clogging by selectively screening larger debris particles. Features convenient carrying handle, keyhole slots for optional fixed mounting and pivot pin fastener for quick and easy access to pump. Includes "Click-fit" coupler for convenient plumbing compatible with other Laguna series pond systems. 3-year warranty. Because of their ability to process water moderately loaded with suspended solid particles (or solids), the Waterfall and Filter Pumps are ideal for use with filtration systems and for creating waterfalls and watercourses. These pumps are designed to transport suspended solids to suitable external filter systems (including pressurized filters), which then trap any debris that could potentially pollute pond water, effectively filtering the pond. Max-Flo pumps are designed to provide continuous and reliable water circulation. They are ideally suited for a variety of pond applications, such as providing water flow to filtration systems and creating spectacular waterfalls. Made in Italy the pumps are powered by a magnetic-driven motor that's unrivaled in the market for generating large amounts of water flow at extremely low energy costs. This is great news for people who are wary of costly electricity bills. In fact, switching to a Laguna pump will often pay for itself in one season. Suitable for ponds up to 3000 US gallons (11300 L). Maximum flow rate is 1500 U.S. GPH/6000 LPH. Includes a Universal "Click-fit" hose coupling 3/4, 1, & 1-1/4 in (19, 25 & 32 mm). 16 ft/5 m electrical cord. Buy Cheap Laguna Ponds Max Flow 1500 Pump, Waterfall Pump Pond, 1500 GPH from Laguna at Discount Price!